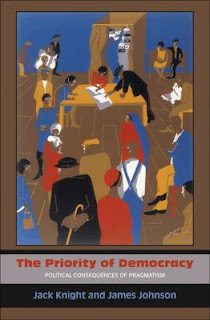 Starting today Crooked Timber is rolling out this seminar (review symposium) on my book with Jack Knight, The Priority of Democracy: Political Consequences of Pragmatism (Princeton UP, 2011). The critics are Chris Ansell (Berkeley), Melissa Schwartzberg (Columbia), Peter Boettke (George Mason), Ingrid Robeyns (Erasmus), Adrian Vermeule (Harvard), Henry Farrell (George Washington) and Cosma Shalizi (Carnegie Mellon). Jack and I offer a reply. Thanks to Henry for coordinating the affair. Why Isn't Your ISP (if you have one) a Utility?